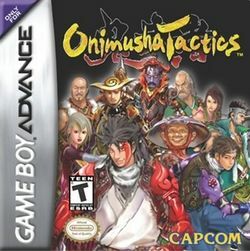 Onimusha Tactics is a strategy installment in the Onimusha series released for the Game Boy Advance. It does not follow the storyline of the previous PlayStation 2 games and is considered a side story. However, the game features a similar plot: a samurai who possesses the Oni Gauntlet can become the Onimusha and fights against Nobunaga and his army of genma. The samurai is Onimaru, who is supported with a wide range of characters, many of which are the same as their PlayStation 2 equivalent. However, there are some returning characters from other Onimusha games such as Saika Magoichi, Ankokuji Ekei, Fuuma Kotaro, and Mitsuhide Akechi. Onimaru battles the genma until you ultimately reach the notorious Nobunaga. New to the series are additional chosen warriors whom receive the power of the phoenix, tortoise, tiger and dragon to assist Onimaru. These animals correspond with the Chinese celestial animals that represent the cardinal directions. This reference was also a puzzle in Onimusha 2: Samurai's Destiny. This page was last edited on 11 May 2016, at 22:42.